The Habit of Art returns as a collaboration between The Original Theatre Company and York Theatre Royal, bringing about the first revival of the hit show since its popular run in 2009. The play is set to run from 23 October to 27 October at the Liverpool Playhouse with a star-studded cast. This critically acclaimed production stands to provide a thought-provoking insight into the world of two renowned intellects- the poet W H Auden, and the composer Benjamin Britten. Notorious playwright Alan Bennett, famous for The Lady in the Van and The History Boys, has created a play which acts as a ‘Mise en abyme‘, more commonly known as a play within a play, which extrapolates the complex layers of human thought and reasoning. 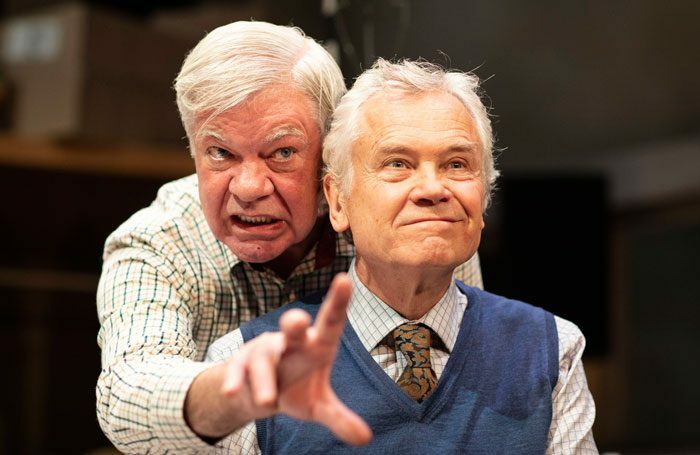 Scenes of heartache, euphoria, and conflict interlace the narrative, with the story unfolding through characters Fitz (Matthew Kelly), Henry (David Yelland), Tim (Benjamin Chandler), and Donald (John Wark). This ensemble of actors are introduced whilst rehearsing a play called ‘Caliban’s Day’ which recreates a fictitious meeting between authors W H Auden, played by Fitz (Kelly), and Benjamin Britten, played by Henry (Yelland). Auden has hired a rent boy called Stuart played by Tim Chandler, however he is mistaken for Humphrey Carpenter played by cast member Donald Wark, who has in fact been employed to write a biography for Auden. Humphrey certainly receives more than he bargained for, as he was only expecting to carry out an interview with the great poet! What emerges from this elaborate, yet intriguing sequence of events is a story which reflects on different types of human interaction from the obsessional to the obscure. The lives of the modern ensemble intertwine beautifully with the men they are attempting to portray, to provide an honest and, at times, deeply moving depiction of life and living in all its convoluted forms. Director Philip Franks has been successful in remaining faithful to Bennett’s original text, creating a play which covers intellectual topics in a highly comedic and almost ridiculous fashion. A certain highlight of the play, which had the audience in stitches, is a scene which reveals Wark in drag whilst also brandishing a tuba. Simultaneously, the play provided an intriguing and insightful awareness into the world of emotion, being able to respectfully poke fun at two such renowned characters. Ultimately, one of the key messages to come out of the play: these great men were no less human than you or I. The Habit of Art provided a truly enjoyable evening, covering a wide range of topics in a particularly unusual style- which appears typical of any Alan Bennett play. If stories of human excellence and imperfection appeal to you, then I would thoroughly recommend going to see The Habit of Art whilst it is still showing in Liverpool. The Habit of Art is at the Liverpool Playhouse until 27 October, before continuing on tour across the UK until the end of the season.